Many of us appreciate having a brad nailer in our shops. Here in Gainesville, Florida I’m limited to a 225 sq. ft. working area. This 2 gallon Campbell Hausfeld compressor is idea for those of us who have small and very small shops. It sits on a 14” x 13” footprint and is only 15 1/2” high at the top of the handle. This oilless, 100 psi compressor only weighs 17 lbs. It comes fully equipped and ready to use with the included 2” brad nailer/stapler. They even include a small quantity of nails and staples and another fitting to enable you to inflate your tires. Although it has a capacity too small for general construction and contractor’s use, it can drive 18 gauge brad nails as fast as I can shoot them. The nailer is easy to load and never jammed. Although made in China, It is designed and engineered by Campbell Hausfeld, a Cincinnati area company well known for their compressors. -- "Heaven is North of the Bridge"
Other than this I do like the unit. Just my 2cents. -- Have thy tools ready. God will find thee work. Noise level – good question. While our over-riding safety concerns with something that can cut us is certainly important, the fact remains that high noise levels in our shop takes our hearing away, little by little, to the point where it eventually seriously impacts our lifestyle. Having done a little work in a sound lab many years back, I would estimate the noise level of this 2 gallon compressor at about 85 dBA at three feet. At this noise level you would have to elevate your voice to talk to someone beside you. This is the “threshold” of hearing loss that OSHA warns us about. Therefore I would recommend wearing hearing protectors, which is a good habit to acquire whenever working with any power tool in your shop. At my “Workshop in the Woods” in the Upper Peninsula, I have a Tool Shop (Menards brand) 4 gallon “pancake type” compressor with a 1 1/2 HP motor. This oil reservoir type compressor has an even higher noise level than the above Campbell Hausfeld. It also vibrates more and tends to creep along the floor. If noise is a problem, try the Senco PC1010, a 1 gallon oil free beauty. I don’t know the weight, but it’s light, and quiet. It will put out about 12 nails from a 16 g finish nailer, too many to count on a pin nailer. Believe it or not, I use it quite often for renovations (but then I have a few Paslode Impulse guns also). I have a HF pancake compressor & the noise level is pretty high on that, and although I’ve had it for years & used it hard, it works great. I’ve managed to keep the noise more manageable by putting it in the cabinet under one of my workbenches & sliding the door shut, just allowing the hose to emerge. I don’t have that compressor but I am using the Campbell brad nailer and feel for what I am doing works great. I am looking at adding the stapler to my bunch to use also. Happy New year and good wood working. -- Bill, Broken Arrow OK. I got one as well, and like the way it works. The noise level is a little loud, but I don’t mind it. How much did you pay for the compressor? 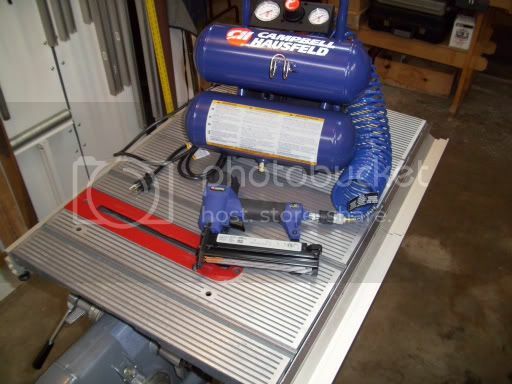 I use a Campbell Brad Nailer with a oil-less air compressor from Cost Co. It is called the All Power America QuietZone Series 1.5 HP 4.6 Gallon Twin Tank Air Compressor It seems to work well and has a lifetime warranty. It is only 55db according to their site and doesn’t move across the floor of the shop. I purchased this Campbell Hausfeld compressor at Lowes for $79. At the glass shop I work at we have a Senco battery operated nailer, shoots up to 2 1/2 in. brads. These are a little pricery but if space is an issuemay be an option. I purchased one of these a couple of yaers ago at Lowes for $59. Yeah, it’s noisey and I would like to have more air capacity. It and the gun work well but of course I am looking to upgrade. I like this Campbell Hausfeld FP209501 2 gallon air compressor for its high quality servie.